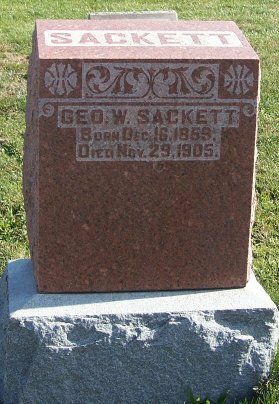 "Illinois, Marriage Index, 1860–1920", database, Ancestry.com, "23 Sep 1886, McLean, Illinois, George W Sackett & Zelia A Freed." Sackett, Baby, son, b. Mar 1900, 2/12, b. IL, father b. IL, mother b. IL. Sackett, Paul, son, 15, b. IL, father b. IL, mother b. IL, waiter, restaurant. "US City Directories, 1822-1995", digital image, Ancestry.com, Bloomington, Illinois, City Directory, 1913, "Sackett Zelia (wid George) r 301 S Low. "; 1915, "Sackett Zela A (wid Geo W), r 203½ S Center. "; 1917, "Sackett Zelia A (wid George) r 306 S Center. "; 1919, "Sackett Zelia A (wid George) r 306 S Center."